Some of the most valuable Alfa Romeo model 6C2500 Super Sport cars were the twenty-eight made in Milan during WWII, between 1942-1943. Six of these were made for high officers of the German Army. This car, built for Wolfram Von Richthofen, is the only known survivor of those six. Von Richthofen, a cousin of the famous WWI fighter pilot nicknamed "The Red Baron," also had an illustrious military career. He served in Italy twice, first in the late 1920's and again in 1941-42 as commander of the 2nd German Air Force in Italy, when he commissioned this Alfa Romeo. In 1943, Von Richthofen served in the campaign against the Soviet Union where he was promoted to Field Marshal, the youngest man ever given this rank. Diagnosed with a brain tumor, Von Richthofen retired in 1944 and died in July 1945 at the age of fifty. While Alfa Romeo manufactured their own sedan bodies for the lower-end versions, for the Super Sports cars they supplied the engine, drive-train and chassis to a custom body or coach builder (carrozzeria). The finest coach builders in Italy built bodies for the 6C2500 models, including Pinin Farina, Touring, Ghia, Bertone, Michelotti and others. The body for this particular car was designed and constructed by Carrozzeria Pinin Farina. Pinin Farina was especially known for his unique and innovative cabriolets. The body of Von Richthofen's car was built as a one-off, custom two-seat cabriolet with custom grille and bodywork. The design is striking because it beautifully combines the sweeping fender lines of the 1930's and the new clean and smooth European body shapes characteristic of the 1940's and 1950's. 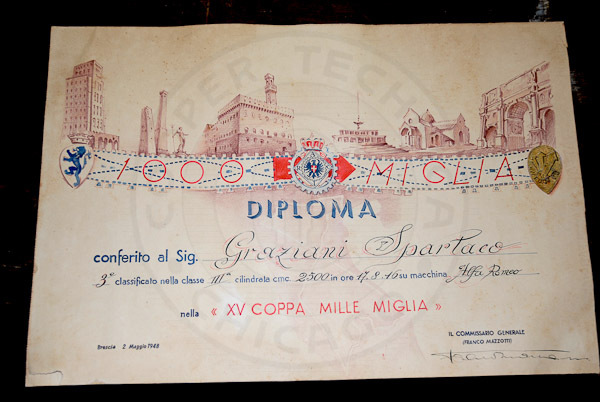 After the war the car was purchased by an Spartaco Graziani of Livorno, Italy. 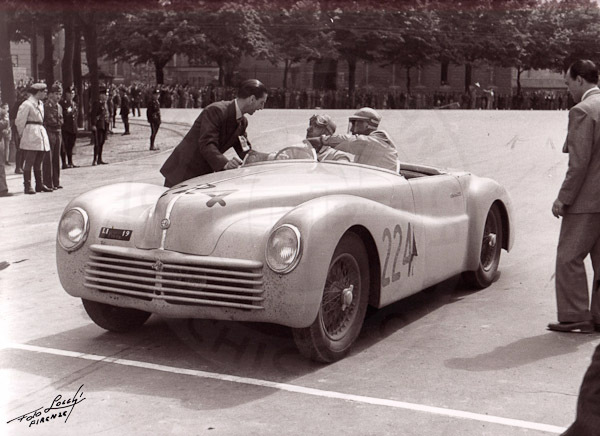 He competed in the 1948 Mille Miglia, the legendary one thousand mile road race from Rome to Brescia and back, finishing the best of the three 6C2500 cars at 3rd in the over 2.0 liter class in a field of 25 cars. The car was later sold to an American Officer serving in Livorno, and then to a car collector in California. Cooper Technica is currently restoring the car back to its original configuration. 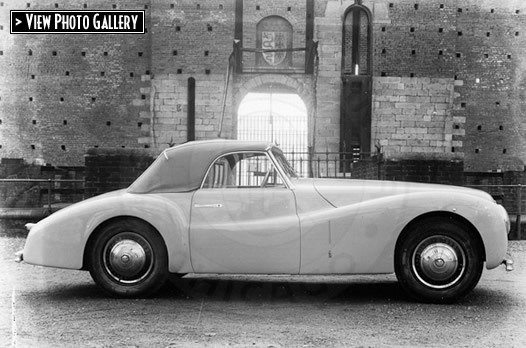 Recently, this Alfa Romeo was featured in an long article from "Old Cars Weekly". 1942 Alfa Romeo 6C2500 Super Sport Pinin Farina Cabriolet custom built for Wolfram Von Richthofen, German Field Marshal General of the Luftwaffe, 1943. 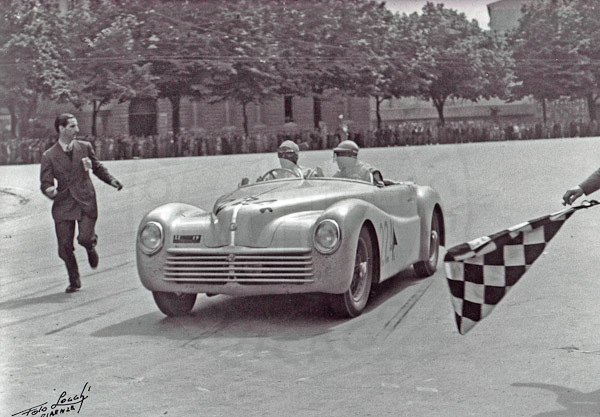 Coming in to the checkpoint at Florence, Italy during the 1948 Mille Miglia. Graziani removed the bumpers, windshield and top for racing. 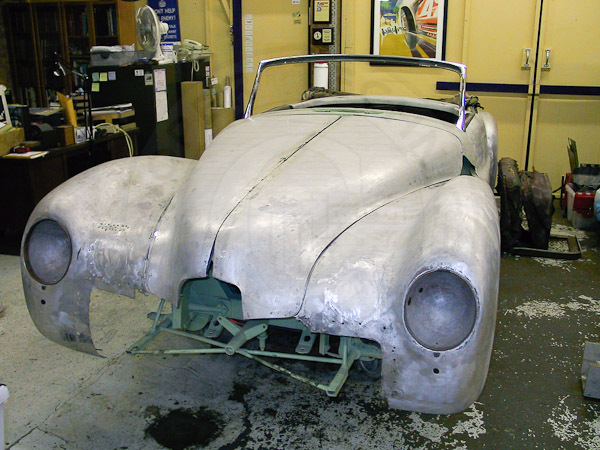 1942 Alfa Romeo 6C2500 SS body with paint stripped and restoration started. 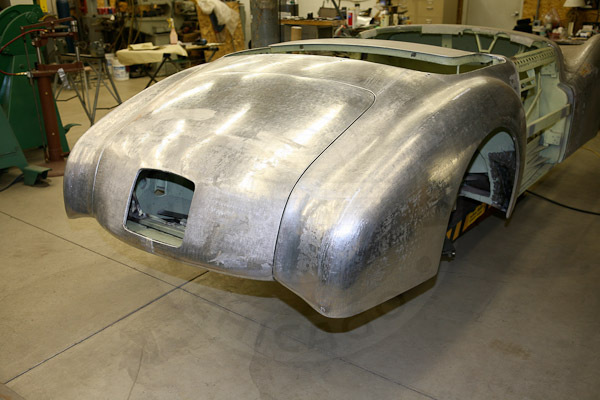 Restoration of rear sheet metal aluminum fenders and trunk area. 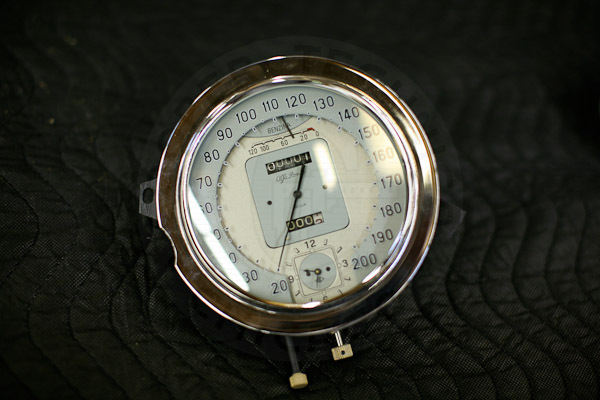 Restored original Speedometer with Fuel Gauge and Clock.